D-Lux LED Luxul Technology Design Lights Consortium are DLC qualified. Luxul light bulbs are designed to support electronic ballasts while saving energy & labor costs. The best energy saving lighting! 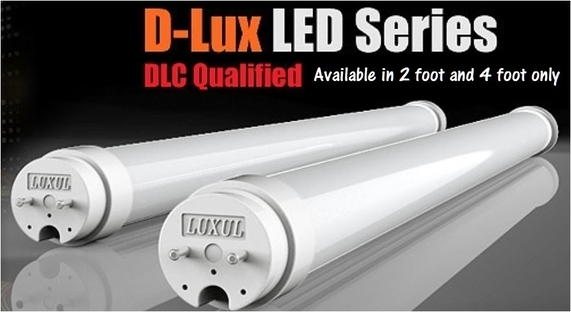 All of Luxul D-Lux 4 foot lamps are DLC proven to be more luminous, operate at a lower temperature & use less than 50% energy compared to standard fluorescent lights. D-Lux series run at a luminance efficacy rating of 111.69 lm/w, a CRI score of 85. ESCS distributes the world's first LED tube lights fully compatible with existing fluorescent lamps using electronic and/or magnetic ballasts. Order lighting plans with virtually 0% maintenance with smart LED and energy cost saving technology info and products. Get 5-year warranties for your existing ballasts. Scan our QR Codes to reach ESCS QRnGO.info for more info. Order here! Find your model number and light bulb below.